Here, Tony and Max are preparing to run the new Satellite and network wiring through the attic and out a new face plate Max put in the wall (yes, a power drill was involved!). Tony also helped install our new pool light! Max found a really neat color changing LED pool light on E-Bay, but before it could be put in, the old, broken light had to come out. 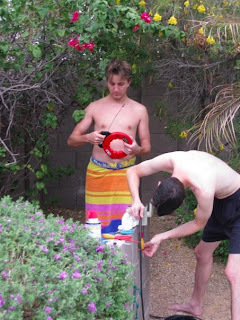 That meant the boys had to hook fish tape onto the old pool light wiring at the electrical box opening, then pull it out through the pool. This is the reason the GFI was tripping (and why the light stopped turning on). Max is pointing to the spot on the old light where a crack had formed in the insulation that protects the wiring (there's even some rust). 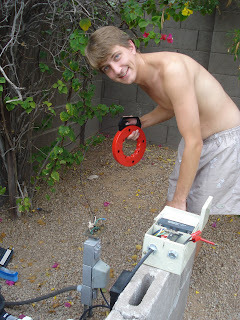 This meant that the power was exposed to the water! 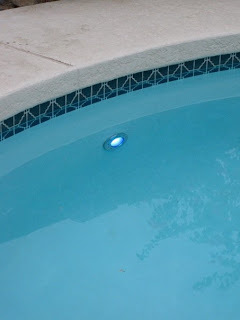 Next, the new pool light wire was hooked to the fish tape (still hanging out the opening in the pool) so it could be pulled all the way back up through to the electrical box. The boys even put it on a timer so it will turn on every night at six! So pretty! 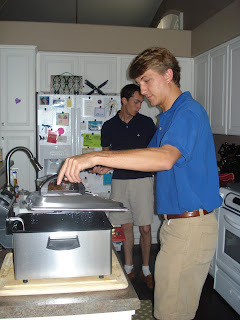 We did have a bit of Food Network time (Tony called it "Cooking With Max and Mande") when we opened Tony's wedding gift for us, a deep fryer, which we had to use right away! I whipped up some funnel cake batter and Max perfected his funnel cake drizzling skills, yum!